Popular historic sites such as Golden City Temple (Wat Xieng Thong) and Wat Mai Suwannaphumaham are in your itinerary. Royal Palace Museum and Traditional Arts and Ethnology Centre are good opportunities to explore the local culture. The adventure continues: take in the awesome beauty at Mount Phousi, look for all kinds of wild species at Kuang Si Falls Butterfly Park, experience rural life at The Living Land Company, and browse the eclectic array of goods at Luang Prabang Night Market. To see other places to visit, reviews, and other tourist information, read our Luang Prabang road trip planner . Singapore, Singapore to Luang Prabang is an approximately 4.5-hour flight. You can also drive; or do a combination of bus and train. The time zone difference moving from Singapore Time (SGT) to Indochina Time (ICT) is minus 1 hour. Expect a daytime high around 39°C in June, and nighttime lows around 28°C. Finish your sightseeing early on the 14th (Thu) to allow enough time to drive to Sayaboury. 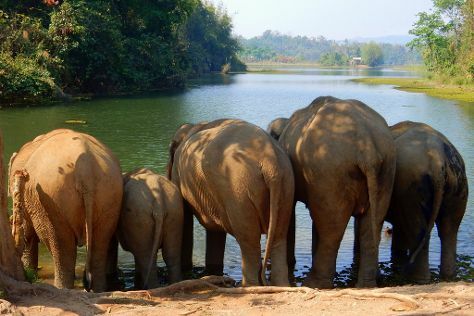 On the 14th (Thu), look for all kinds of wild species at Elephant Conservation Center. For where to stay, other places to visit, traveler tips, and more tourist information, read our Sayaboury journey planner. Getting from Luang Prabang to Sayaboury by car takes about 3 hours. Other options: do a combination of bus and taxi. In June in Sayaboury, expect temperatures between 38°C during the day and 28°C at night. Finish your sightseeing early on the 15th (Fri) to allow enough time to travel to Champasak Town. Start off your visit on the 15th (Fri): look for gifts at Chez Maman and then explore the ancient world of Wat Phu. To find traveler tips, ratings, reviews, and tourist information, refer to the Champasak Town online trip itinerary builder . You can do a combination of taxi and flight from Sayaboury to Champasak Town in 5 hours. Other options are to do a combination of car, flight, and taxi; or drive. June in Champasak Town sees daily highs of 37°C and lows of 30°C at night. Wrap up your sightseeing on the 16th (Sat) to allow time to travel to Vientiane. Kick off your visit on the 16th (Sat): take in panoramic vistas at Patuxai, don't miss a visit to Wat Ho Phakeo, pause for some photo ops at Black Stupa (That Dam), then stop by Talat Sao, and finally contemplate in the serene atmosphere at Great Sacred Stupa (Pha That Luang). Get ready for a full day of sightseeing on the 17th (Sun): stroll through Mekong Riverside Park, admire the striking features of Ho Pra Keo, contemplate in the serene atmosphere at Wat Si Muang, then take in the spiritual surroundings of Wat Si Saket, then pause for some photo ops at Buddha Park, and finally savor the flavors at Vientiane Organic Market. To find photos, other places to visit, traveler tips, and other tourist information, refer to the Vientiane sightseeing app . Do a combination of taxi and flight from Champasak Town to Vientiane in 2 hours. Alternatively, you can drive; or do a combination of taxi and bus. In June, daytime highs in Vientiane are 39°C, while nighttime lows are 30°C. Finish your sightseeing early on the 17th (Sun) so you can travel back home.